Veritas Soap Co. Lip Balms last so unbelievably long! Our Lip Balms are pigmented with Organic fruit juices, oxides & vegetable powders. Now the whole family can have safe & natural chapped-free, super soft lips all day! 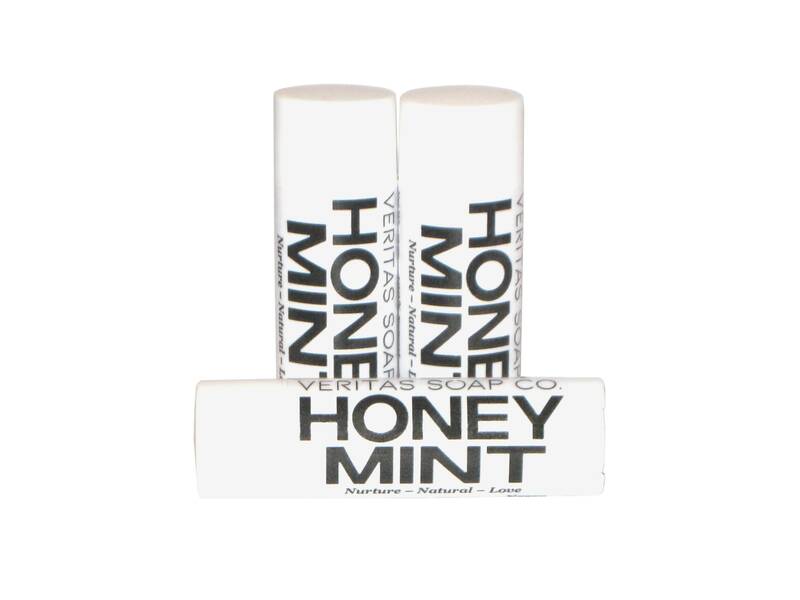 HONEY MINT LIP BALM - This silky smooth Lip Balm is formulated with Raw Organic Honey which helps to keep your skin clean & clear. Andiroba Oil and Meadowfoam Seed Oil contain natural alpha-hydroxy acids which helps to strengthen the collagen and elasticity in your skin. The Pure Essential Oil blend leaves your lips with a slight cool tingle without being too "minty". This lip balm is sweetened with organic Stevia. This Lip Balm applies clear. INGREDIENTS: Organic Coconut oil, Andiroba Oil, Meadowfoam Seed Oil, Candelilla Wax, Carnauba Wax, Rice Bran Oil, Stevia Extract, Organic Raw Honey, Pure Essential Oil Blend & Vitamin-E (Tocopherol).